Connie Vacho, at right, presented her catering do’s and don’ts to her peers during a Taher Inc., professional seminar last year. 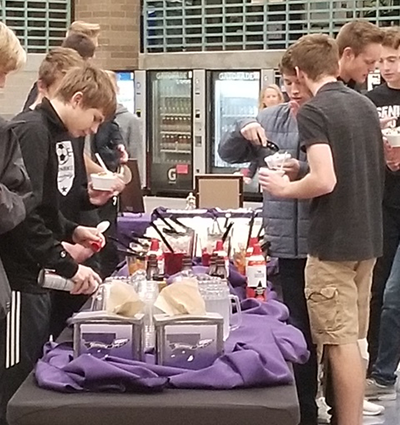 Connie Vacho, director of foodservice at Waunakee (Wis.) Community School District, presented her best practices for catering to her peers last summer at a Taher professional seminar. The fundamentals she shared are a great checklist for hiccup-free (as possible) catering in the K-12 world. 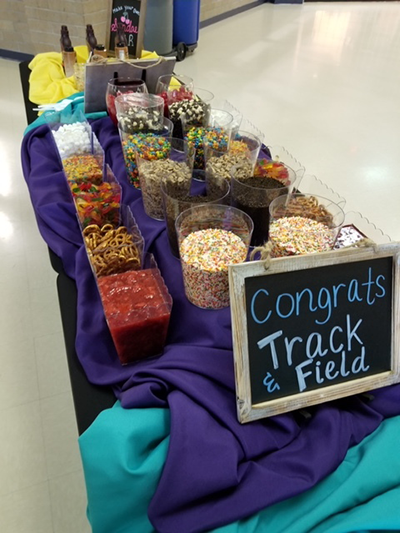 Opportunities for catering have been found at Waunakee in events from small faculty meetings to sports banquets and grad parties. Of course, as everyone who caters knows, the event must begin long before the tables are set. Vacho sees the menu as a good point to begin collaboration with the customer you’re catering for. Communicating/distributing the menu: Vacho has gotten the word out about catering options in a number of ways. “I’ve emailed the entire district staff, emailed through the parent portal, print color copies and stuff each and every mailbox in the district and we have color copies of the menu readily available at all registration days and back-to-school events.” Vacho recommends updating and redistributing the menu several times a year to keep it at the forefront: at the beginning of the school year, in December/January and again in April/May. Include special offers, like a graduation deal, in the appropriate updates. Communicate where the money goes: Many folks in the school community may not think about it, but if profits from catering go back into the school district, be sure to let them know. “Teaching staff love to know that the money they spend of allocate is staying local and that they’re supporting their own employer,” Vacho says. Big or small, go all out: “Remember, there’s no event too small,” Vacho says. “All catering—even if it’s only for eight people—has a long-lasting effect. Word of mouth is huge!” People are watching—the setup, the pictures posted on social media and “they hear all about the good and bad,” Vacho says. Listen to improve: Gathering feedback goes hand in hand with this time just after the even when reactions are coming out, allowing you to find areas with room for improvement. Communicate constantly to your customer and to your staff: Overcommunicate, in other words. This means timely reminders and an updated worksheet or order form for internal use and courteous communications with the customer so everyone remains on the same page and surprises in logistics are minimized. Organize your records: Keep copies of the invoice, catering worksheet, old menus and all. This way, you and your team will have a point of reference that can save you from reinventing the wheel for similar events.